At Clarity Financial Planning, Inc., we are passionate about helping you make smart decisions so you can pursue your goals and work toward fulfilling your hopes and dreams for the reasons that are most important to you. Our clients look to us to deliver financial confidence. 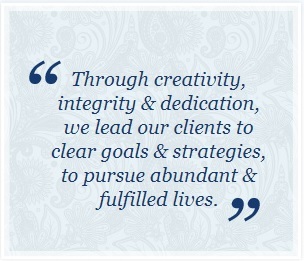 Clarity Financial Planning's mission is to improve your quality of life through our planning process. In essence, the focus, clarity, and simplicity that result from aligning your financial choices with your values helps to enable you to make the most of lifes opportunities. Contact us and we can discuss what having an abundant and fulfilled life means to you.